Description: On the go and throwing Snow! Description: BNSF 6216 waits for a crew. Description: BNSF 6216 comes off the siding (with an Exce in the second spot), and over the bridge with it's full load of coal. Description: The 6216 leads a loaded coal drag through Ashland NE. 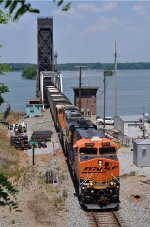 Description: BNSF 6216, BNSF 6326, & BNSF 9917 lead this empty coal train into Winfield, Mo. after just hitting the detector at mile post 55.2. Title: EB 6216 barreling down upon us in full dynamics. Title: BN 6216 with the Kraft water tower in the foreground. Wonder if they make Mac and cheese there??? It was about lunch time! Description: This was my son's last day before school started. He took this, but the train was moving at a good rate, thus the slight blur. Description: BNSF 6216 leads K036 loaded crude oil train bound for Philadelphia through CP Park.